Earning a Utah drivers license should be simple. We know your goal is to get in the drivers seat as soon as possible and with as little hassle as possible—and we can help you. You've got questions, and DriversEd.com has the answers. Need information about the specifics of permits and licenses in Utah? Just want to know a lot more about what we can do for you? Read on! This DPS-approved drivers education program includes an online classroom portion, 6 hours of in-car observation, and 6 hours of in-car driving lessons with a licensed instructor. To start your Utah online drivers ed course, just create an account. Once you complete payment, you can schedule your in-car observation and driving lessons with A-1 Driving School, our Utah affiliate. Please note: before you can start in-car driving lessons, you'll also need to pass a written test for your learners permit. You can take the written test whenever you're ready at your nearest Utah Drivers License Division. To complete the online class portion, you'll need to take your final written exam at A-1 Driving School. 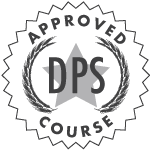 Once you've completed both the online class and in-car lessons, we'll give you an official Certificate of Completion, which you can take into the DPS to apply for your license. If you're 18 or younger, you must take a DPS-approved Utah drivers education course to earn your license. The drivers ed program consists of a classroom part, 6 hours of in-car observation, and 6 hours of drivers training with an instructor. If you're 19 or older, you have two options. First, you can hold a learners permit for 90 days and practice driving with a licensed driver for 40 hours (10 hours at night) before you can apply for your drivers license. Or, second, you can complete the drivers ed program and skip the 90-day period with the learners permit and 40 hours of practice driving! Learning with our online course and with a professional driving instructor helps you become a skilled and confident driver. DriversEd.com lets you complete the classroom portion conveniently online through our quality, interactive course. Enjoy a fun, fast, and easy way to complete your drivers ed class. Once you earn a learners permit, you can start in-car driving lessons with our driving school affiliate–A-1 Driving School. Experienced instructors teach you basic maneuvers, how to manage driving risk, and everything you need to learn to become a safe driver. You must be at least 15 years old to take drivers education. Before you can begin in-car driving lessons with a licensed driving instructor, you will need to pass a written learners permit test at your nearest Utah Drivers License Division. You can begin the online portion of drivers education without your permit and whenever you're ready, take the written permit test. Once you pass the required written exam and pay a $15 fee, you'll be issued a learners permit, valid for one year. Provide a state-certified birth certificate, social security card, and one additional identity document (such as a school ID, preferably with photo). No photocopies of these documents will be accepted. Provide proof of Utah residency. If under 18, parent/guardian must sign application and financial responsibility affidavit. Pass all medical and vision screenings. If you are under 18, you can only drive with an approved driving instructor, parent or legal guardian with a valid license, or the responsible adult who signed for the learners permit with a valid license. If you are over 18, you can drive with another licensed driver who is at least 21 years old and occupying the right front passenger seat. Once you complete the online class, the 6 hours of in-car driving lessons and 6 hours of in-car observation, we'll issue you a Certificate of Completion for free. Next, you will need to practice driving under supervision in accordance with the restrictions of your learners permit. If you are under 18, you must hold your learners permit for at least 6 months and you must log at least 40 hours (10 at night) of supervised driving. The driving instruction you complete with A-1 Driving School counts toward this 40 hour supervised driving requirement. If you are 19 or older, you can either hold a learners permit for at least 90 days and complete 40 hours (10 hours at night) of driving practice with a licensed driver, or you can complete our drivers education program. Our interactive online course is designed to help you learn, and A-1 Driving School offers professional driving instructors to help you gain skill and confidence behind the wheel. Now it's time to schedule an appointment for your driving test at your nearest Drivers License Division. Have held your learners permit for at least 6 months if you are under 18. Have your parent/guardian sign your application and financial responsibility affidavit, and certify that you have had at least 40 hrs (10 at night) of supervised driving practice. Present a drivers education Certificate of Completion (all first time drivers). Once you pass the driving test, you'll be issued a Utah drivers license! For the first 6 months, you cannot have any passengers in the car unless the passenger is an immediate family member. Exceptions: you must have a note from a parent or guardian giving permission to drive with passengers directly to and/or from a school or religious activity, have a licensed driver at least 21 years of age sitting next to you, be driving for agricultural work, or driving for an emergency. Until you turn 17, you cannot drive between the hours of midnight and 5:00 a.m. Exception: You may drive directly to and/or from school, a religious activity, or your place of employment, or have a driver at least 21 years of age sitting next to you, be driving for agricultural work, or driving for an emergency. Who needs to take Utah drivers education? Teens 18 and younger in Utah must take a DPS-approved drivers education course and earn an official Certificate of Completion before receiving their first drivers license. Drivers 19 and older must either hold a learners permit for 90 days and complete 40 hours of driving practice with a licensed driver or complete a drivers education program. DriversEd.com's online course is DPS-approved and fulfills the Utah drivers education requirement for new drivers. Yes. Our online course is DPS-approved and is equal to the regular 30-hour, in-class drivers education course, and our in-car lessons are taught by fully licensed and experienced driving instructors. After completing our program, you'll have everything you need to earn your drivers license. What does the Utah drivers education program include? As required by Utah state law, our program consists of two parts—30 hours of drivers ed class time, 6 hours of in-car driving lessons, and 6 hours of in-car observation with a licensed instructor. You take the classroom portion online and your in-car driving observation and driving lessons with our affiliate driving school in Utah, A-1 Driving School. Where do I take my in-car observation and driving lessons? Mon-Fri: 6:00 p.m. to 8:00 p.m.
Mon-Thurs: 4:00 p.m. to 6:00 p.m.
Tuesday and Thursday: 4:00 p.m. to 6:00 p.m.
Mon-Fri: 4:00 p.m. to 6:00 p.m.
Mon-Thurs: 10:00 a.m. to 6:00 p.m.
Mon-Fri: 6:05 p.m. to 8:05 p.m.
Mon-Fri: 10 a.m. to 5:00 p.m.
Can I try the online Utah drivers ed class before I have to pay? That depends on your individual pace. In Utah, all online drivers education courses must be at least 30 hours. The good news is that with DriversEd.com, you can always go at your pace and log in and out at your convenience. Think how fast time flies if you do 20 minutes here and there! After you complete this online class and your in-car observation and driving lessons, your driving instructor from A-1 Driving School will issue you an official Certificate of Completion. Our Utah drivers education program includes our DPS-approved online class, 6 hours of in-car driving lessons, and 6 hours of in-car observation with experienced licensed instructors for a combined total of . Our online course lets you have fun learning with interactive lessons that teach you everything you need to ace your final written test. Enjoy in-car driving instruction and feedback from experienced instructors. When you've completed both parts, you'll receive an official Certificate of Completion included in the course price. Your tuition fee covers your online Utah drivers education course, 6 hours of in-car observation, and 6 hours of in-car driving lessons with a licensed instructor. You'll get a DPS-recognized Certificate of Completion and 50 free practice permit tests. Our online Utah course teaches you the most up-to-date driving techniques and includes fun, interactive lessons, which increase your ability to remember safe-driving rules. You'll learn to drive with fully certified instructors with over 30 years of experience. Lessons cover basic maneuvers, how to manage driving risk, and everything you need to learn to become a safe driver. It is important to us that you are satisfied with your purchase. If you change your mind about the course, within thirty (30) days of purchase, we'll refund the full cost of the course purchased on our website, less a $100 processing fee. Processing fees will be waived IF A1 Driving School (UT) has been notified of the intent to cancel within one (1) week of registration. Additional fees will be charged if any drives ($50 fee) or in-car observations ($30) have been completed. Thirty (30) days after registration, all refunds for unused lessons must be requested directly from A-1 Driving School (UT).